An year ago, I blogged about some suspicious events in the Office 365 Unified Audit log, that seemed to correspond to some “Unknown” principal. The culprit turned out to be users clicking on sample links to files/sites hosted in my tenant’s SPO instance, which I’ve posted on various blog sites and forum posts. Since then, Microsoft has made some changes to the way events are being presented in the Unified audit log, and those “unknown” entries seem gone for good. As with our previous SharePoint-related investigations, the next step I took was to look at the extended event information for those entries. As expected, the ActorContextId value did not match the one for my tenant, so this was again a case of someone trying to access a resources in a different tenant. The user IDs visible form such entries most definitely did not correspond to a Guest user in my tenant, so I figured this is just an “updated” view of all the “Unknown” entries I’ve dealt with previously. Surprisingly though, I wasn’t able to see any of the SPO related entries in the log. More importantly, while I had some understanding on how a user can generate such entries for SharePoint Online, the case of Exchange Online was a bit more puzzling. Yes, we do have a web-based endpoint for Exchange Online and we can use it in order to replicate the SPO behavior. I can simply login to my tenant, then try to access a mailbox from a different tenant via direct link such as https://outlook.office365.com/owa/user@othertenant.onmicrosoft.com. Such events have never been visible in the audit logs however, and a quick test on my end confirmed that this method indeed didn’t generate any new entries. So I continued to look at the extended event information for additional clues, until I spotted the value of the ApplicationId, namely a0c73c16-a7e3-4564-9a95-2bdf47383716. You will not find this id listed anywhere in the Azure AD portal or PowerShell, however from my previous fiddlings with the ExO MFA PowerShell I was well aware that it corresponds to the “Microsoft Exchange Online Remote PowerShell” application. Knowing that, it was easy to reproduce the workflow that results in generating such requests. It was all due to users copy/pasting the PowerShell code samples from the above article, without changing the tenantID on the first line. This in turn results in the user getting a token with incorrect issuer value, as shown below. 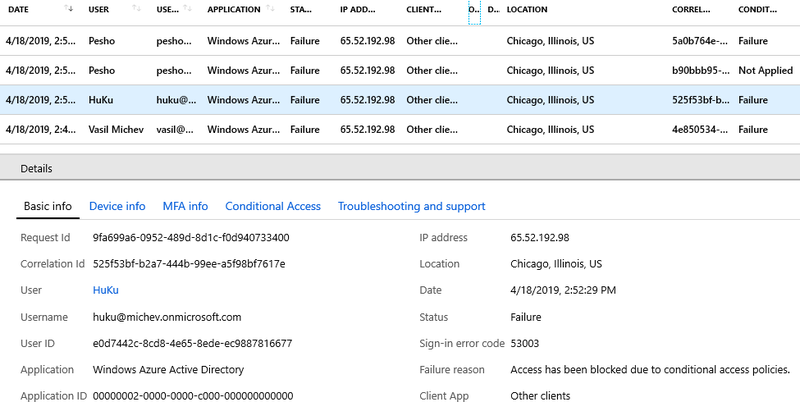 While Azure AD issues such tokens in the first place is a different question, especially considering the scope (level of permissions) being issued as part of the token. 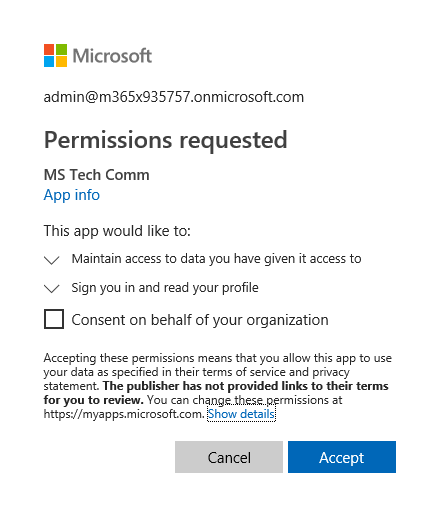 Few weeks back, a question on the TechNet forums caught my attention and got me thinking of what’s the proper way to “reset” folder-level permissions in a mailbox. My initial thoughts on the subject resulted in the outlining of some building blocks that such a solution should address, and were published in this article. Now, I’m presenting you with a PowerShell script that should make the process easier. Invoking the script with the above set of parameters will cause it to enumerate all Room mailboxes in the organization, then for each mailbox go over the list of folders and remove any non-default permission entry. Folders will be enumerated via the Get-MailboxFolderStatistics cmdlet, which makes sure that any “known” folder type will be returned, regardless of the regional settings of the mailbox. In addition, any user-created folder will also be returned. Lastly, a bunch of “safe to ignore” folders is used to exclude entries that you shouldn’t care about. In case you want to make adjustments to the types of folders to include or exclude, edit the corresponding lists at line 6 and 11 of the script. ResetDefaultLevel – use this switch parameter when you want to also “reset” the Default entry for each mailbox. This will stamp each Calendar folder with the ‘AvailabilityOnly’ permission level for the Default principal, and the ‘None’ permission level for every other folder type. Quiet – used to suppress script output to the console. WhatIf – used to run the script in ‘preview’ mode, showing you which permissions will be removed, without actually making the changes. Very useful as troubleshooting tool and recommended as a first run experience. Verbose – forces the script to spill out a bunch of additional output, useful for troubleshooting purposes. The script can be run against Exchange on-premises or Exchange Online, and utilizes implicit remoting for both. This in turn allows better control over the amount of data flowing over the wire and should reduce the execution time in most scenarios. However, as numerous cmdlets are run for each mailbox (getting the mailbox, getting the folders, getting the permissions for each folder, removing the permissions for each folder), things can easily add up and you might end up hitting throttling limits. To help address such scenarios, small delays are added before processing each mailbox, which you can adjust as necessary (lines 122 and 139). 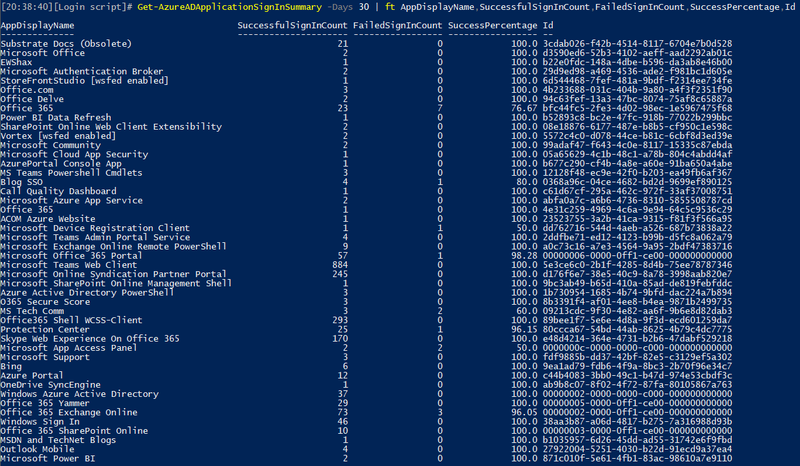 Because it supports various Exchange install types and because of the numerous connectivity methods available nowadays, the script does not include any logic to connect to Exchange Remote PowerShell. You will have to take care of this on your own, before invoking the script. The script however will detect any existing sessions and try to reuse them, where possible. The script deliberately ignores any permissions entries for which the UserType value is Unknown or Anonymous. Only UserType values of Internal and External are removed, while the Default value is replaced (only when the –ResetDefaultLevel parameter is used). Lastly, the script will generate a CSV file with all the permission changes made, which you can find in the working directory. For additional information or to download the script, head to the TechNet Gallery or GitHub. 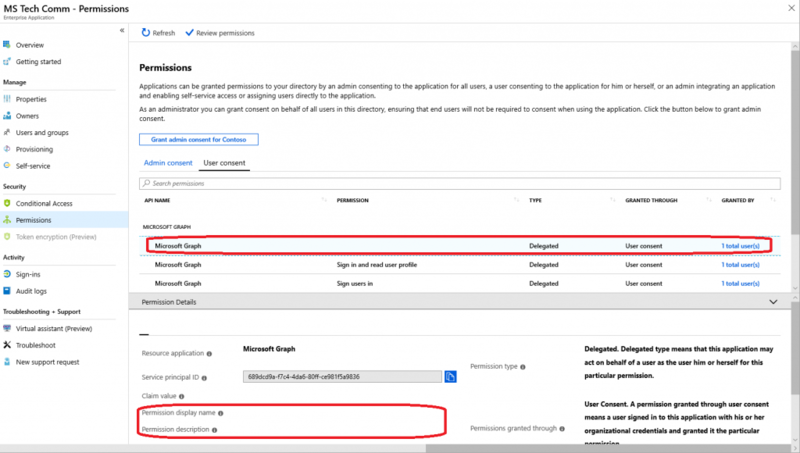 Get-AzureADMSIdentityProvider – used to view the settings of the different identity providers you have configured for your tenant. In case you have missed it, Microsoft announced Google federation a while back, and also supports Facebook, Amazon, or LinkedIn according to the documentation. Get-CrossCloudVerificationCode – and undocumented cmdlet, which seems to correlate to a newly introduced method for domain verification. All my attempts to run the cmdlet have failed with a “Specified HTTP method is not allowed for the request target.” message. Confirm-AzureADDomain now features a CrossCloudVerificationCode parameter, supposedly accepting the code generated with the Get-CrossCloudVerificationCode cmdlet. Cross-cloud here most likely means cross-Office365-instance, for example when you are trying to move between 21Vianet and the multi-geo instance? Lastly, two additional parameters have been introduced to the New-/Set-AzureADApplicationProxyApplication cmdlets: IsPersistentCookieEnabled and IsSecureCookieEnabled. In addition, the Status property will contain information about the last failure event details, current at that time. Get-CrossCloudVerificationCode – which we already covered above, so it doesn’t count. With regards to updated cmdlets, only the Confirm-AzureADDomain one has received some attention, with the CrossCloudVerificationCode parameter added (discussed above). A thread over at the TechNet forums got me thinking about what is the best (or at least a proper) way to “reset” folder level permissions, with the added challenge of doing it in bulk. Generally speaking, it’s a simple operation, at most you’d have some loop running Remove-MailboxFolderPermission on each entry. But, there are some intricacies, so let’s dig in. Right? Wrong. There are actually many issues with the one-liner above, starting from the fact that we are not using the proper User identifier. As we’ve discussed in other articles, the Get-MailboxFolderPermission cmdlet returns the reduced recipient object, and not a string value. Thus, a correct entry to use would look something like: $_.User.ADRecipient.ExchangeObjectId.Guid. Now that’s a loooong one-liner, but frankly we are still just getting started. There are many additional factors that we need to address, such as the actual folder names, as depending on the localization, the Calendar folder might be renamed to Kalender or whatnot. Then, what if we want to include all folders in the mailbox, not just Calendar? And there are things to consider when removing the permissions as well, such as dealing with orphaned entries, external permissions, published Calendars. Are you getting bored yet? Account for the type of User, and depending on it handle things accordingly. In other words, for each permission entry, look at the $entry.User.UserType.Value. Available values will include Internal, External and Unknown and all of these will have to be handled differently. Utilize the Get-MailboxFolderStatistics cmdlet to get a list of the localized folder names and trim the list to only include folders you care about. There’s no point in adjusting permissions on Purges folder for example. If you are using the above method to get the localized folder names across multiple mailboxes, you need to start to account for throttling! Decide what you want to do with the Default (and Anonymous) permission level. The regex we used in the above example can be generalized to exclude other entries as well, if needed. Put some logging or utilize the –WhatIf parameter to “preview” the result. The script I published on the TechNet Gallery a while back can help you get started with all this. And I’ll get started on actually turning all of the above into a proper script. In the meantime, those nifty one-liners should do. Note the lack of Permission display name and Permission description values, pretty important ones if you ask me. And it turns out this isn’t a single/random occurrence, I was able to reproduce the exact same behavior by using a new tenant to access the MTC and provisioning the app. Moreover, other applications in my tenant seem to show the same trait, prime example being the Graph explorer application! PS C:\> "a b c d"
On the other hand, it might be something more serious, so I’ve probed some folks about it. Whatever this turns out to be, it would be nice if we had consistent display across all admin endpoints.